Provides a convenient solution for privacy and glare reduction, while also decreasing energy costs and protecting furnishings from damaging UV rays. Compatible with various types of controls from hand-held remotes, wireless wall switches, table top controls, timers and third-party automation systems. Clean premium design with brushed aluminum finish. Adjustable limit setting provides alignment of drapery fabric. Patented control module cover design conceals unsightly cables and protects the connectors and control modules inside the motor. Advanced track design and swivel ceiling bracket minimize the light gap. Improved arm design provides even overlap and even stacks back. Patented flexible master carrier reduces friction and is adaptable to various drapery types. 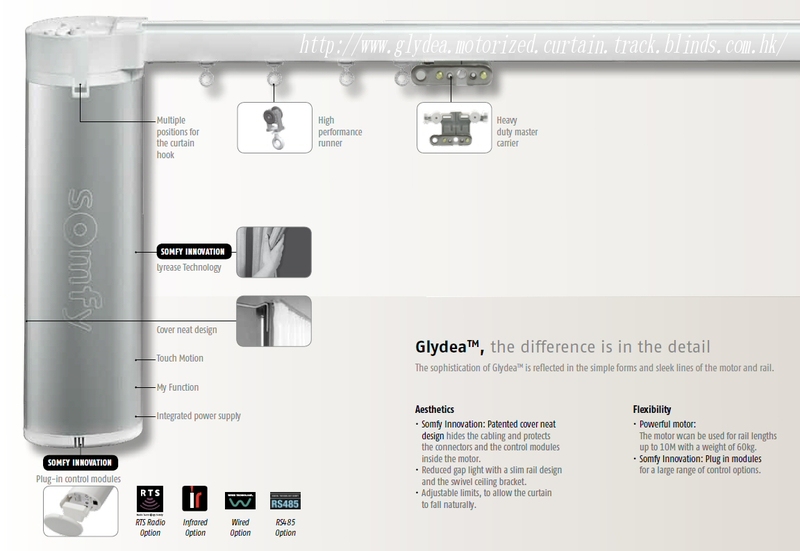 Various control modules allow Glydea® to easily integrate with third party control protocols. Drapery Track is available with custom curves and bends. Exclusive cable cover allows you to reverse cable direction for easier access to power. Spring loaded one-touch hardware (wall and ceiling mount). On center opening tracks, motor can be installed to the right or to the left side of the track. Automatic or adjustable limit setting. Inverse (top mount) option allows the motor to be installed above the track. Touch Motion feature allows the user to activate the motorized drapery simply by pulling on the fabric. Two sensitivity settings available. Manual Override disengages the motor when drapery is adjusted manually. This is ideal for power outages and also protects the fabric from damage. My Function allows user to set a preferred drapery openness position for a quick access. Motor design and advanced high performance belt drive system provide quiet operation (44dBA).